The Lawn Care Site Blog is one way to find new or updated articles by The Garden Counselor. No need to search the whole site for content you haven't seen. Several new articles are submitted each week on a variety of topics. Benefit from completely new subjects being added to the site. Learn more details or different angles on existing topics. This is also the place to find postings of answers to timely questions from our readers, as well as sharing significant ideas from other sources. Just scroll down the page for a title and summary and click on the link when you find a topic you can't garden without! What is another way to get this information? You can use an RSS reader to bring new, constantly updated material to you, from the Garden Counselor and all your favorite sites. No need to chase and check whether a site has been updated. If you currently have a favorite RSS reader, click on that button to copy and load this link. Or click on the line below the orange RSS button for an explanation, if you are not familiar with this excellent way to receive content you like, at your convenience, without searching the web! Questions or Comments? We welcome your participation! PreEmergent for Lawns: A User’s Guide to Weed Preventer Products. Preemergents don't work- unless you understand the tricks & timing of weed prevention. Tips and Cautions to effectively stop weeds before they start. Continue reading "PreEmergent for Lawns: A User’s Guide to Weed Preventer Products. " Hoping Turflon Ester will kill bermuda grass? The label offers control. 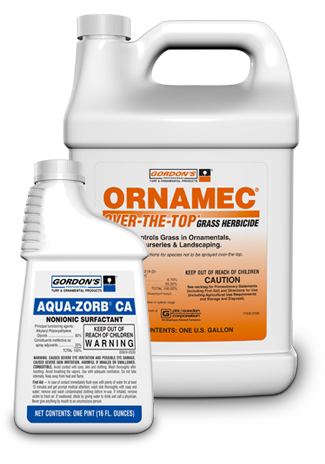 Get help to use this weed killer correctly and suppress bermuda in fescue lawns. Continue reading "Turflon Ester to Control Bermuda Grass: How To Use It"
Using Ornamec OTT to kill bermuda grass? Read the label and hope to understand it! Get help to use this grassy weed killer correctly and suppress bermuda in fescue lawns. Continue reading "Ornamec To Control Bermuda Grass: How To Use It"
When a Burned Lawn is the reward for using a natural method, can the grass be salvaged? Get advice on Ammonia, from the FAQ series on Lawn Care. Continue reading "A BURNED LAWN, Thanks To Homemade Fertilizer!" Brown grass in isolated areas? Due to evergreens, or other common conditions, fully discussed in the FAQ series on lawn care. Continue reading "BROWN GRASS: Caused by acidic soil, or another problem?" Hired SCOTTS LAWN SERVICE — Still Have A Brown Lawn! Keep Scotts Lawn Service? Make them fix the Brown Lawn? Is it the Irrigation System? An FAQ entry in this Lawn Care Series of Articles. Continue reading "Hired SCOTTS LAWN SERVICE — Still Have A Brown Lawn!" A Brown Lawn resulted from applying weed killer on grass. The Weed-B-Gon acted like Round-up! How to deal with trouble -- in this FAQ series on lawn care. Continue reading "A Brown Lawn After Spraying Weed Killer"
Crabgrass control is often a catch-up game. This St. Augustine lawn needs help after the owners got lazy. Will their ideas for new sod work? Continue reading "Crabgrass control after taking time off." Treating Crabgrass in a Lawn In Hot Weather. OK? or not? Treating crabgrass with weed killer sprays in hot weather may kill weeds plus grass! Account for all the factors before you decide. Continue reading "Treating Crabgrass in a Lawn In Hot Weather. OK? or not?" Crabgrass Identification: We Need Help! "Crabgrass identification has escaped us for this invasive weed! How can we confirm what we are dealing with?" See more FAQ now! Continue reading "Crabgrass Identification: We Need Help!"